On the 18th of the Aster's Gloom in 2030 D.C.E, the continent of Ayvarta, ruled by the Socialist Dominances of Solstice, awakens to a surprise invasion by the Nocht Federation and its allies, who accuse the Ayvartan government of fomenting unrest in their nations, and who also just want to take out the commies once and for all and access Ayvarta's vast resources. Disorganized at first, the Ayvartans struggle to reequip themselves for battle, and to fight back against the grey tide. Now various characters on both sides of the conflict have some hard choices to make. 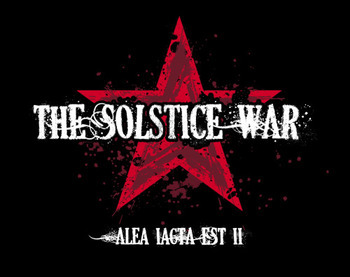 The Solstice War is a Web Serial Novel about a low fantasy world going through its own version of World War II, with similar tactics, equipment, and historically parallel battles (for the most part...) It started in late 2013 as one of several other scattered pieces of fiction on author Madiha N. Santana's blog, but eventually came to dominate the page through 2014 and on. One "book" is now complete. Each update is between 10,000 and 15,000 words divided into 4-5 "scenes." You can read the 1st chapter here. Updates come twice a month, usually around the end of the month and the middle. There are also side-stories that get posted earlier in the month, around 3000-4000 words apiece. Ace Custom: Noel's Ranger tank, called Königin was a prototype made toward his predilections. It's very fast, very light and maneuverable, and it can be crewed by only two people instead of four. A Lighter Shade of Grey: Both sides get a lot of screen time to air their views, and their characters are humanized, but it's clear that the story is more sympathetic to Ayvarta than to Nocht and its allies. About the only constant is that politicians on both sides are largely blamed for the conflict. Attack Its Weak Point: Depending on the caliber of the gun, tanks can only be easily destroyed by shots from the side or rear, or shots that are delivered within a certain range of the target, or fired at a certain angle. Boring, but Practical: The 76mm Kn K-3 gun is by far the least impressive of the Raktapata's potential guns. But it gets the job done without any dangerous accidents. Break the Cutie: Helga Fruehauf tries her best to make the hectic world of army communications as comfortable as she can for her subordinates and herself, but after Bada Aso, she can find comfort only in alcohol and cigarettes. Break the Haughty: Anton Von Sturm is introduced as a rising young star in the Nochtish military, full of confidence and bravado. Madiha then slowly slashes his army apart and later annihilates it completely before his eyes. Cast Full of Gay: A lot of the principal characters are either outright or ambiguously gay or bi. This is slightly more prominent with Ayvartan characters, as orientations other than straight are fairly commonplace. Citadel City: The eponymous city of Solstice is an insanely hard target. Good luck, Nocht. Crippling Overspecialization: Madiha is an excellent military commander, a good fighter, and well-read in socialist politics. Outside of those things, she is prone to having no idea about very basic things, such as that a dragon is not a bird. Cruel and Unusual Death: One of Von Drachen's men has his skin slough off and his body emaciated alive when he is turned into a Majini by Brass Face. Dark and Troubled Past: A lot of characters, but Madiha Nakar's is hinted from the get-go. Doomed Hometown: A lot, as the Nochtish army advances, but especially bitter for Leander. He becomes an Ayvartan citizen and within a few days has tanks rolling through his adopted hometown! Drives Like Crazy: Gulab manages to do this in a tank, and she terrifies her squadron so much that her CO forbids her from attempting to drive a tank again. Eagleland: Nocht is actually more this than it is Nazi Germany despite all of the German and Panzers and etc. Eldritch Abomination: Brass Face and the Majini. Fantasy Counterpart Culture: Every culture in the Solstice War is one. The Socialist Dominances of Solstice/Ayvarta is a Hindu-African Soviet Union. The Federation of Northern States is a German speaking United States analogue that acts as WW2 Germany. Geographically, it seems to be a counterpart to Europe, but ruled from a Scandinavian counterpart. One recently subdued and incorporated state is Frank, which is a close counterpart to France. Achim Lehner is a close counterpart to Hitler, but crossed with distinctly American elements such as criminal connections and a love of capitalism and technology. The Kingdom of Lubon is the Kingdom of Italy but full of elves and a royal family more closely based on Britain. The Svechthan Union is...Russia. Again. But full of hobbits this time. The Empire of Hanwa is a pretty straight Empire of Japan. Kitan is implied to be China, but hasn't been referred to much. Hanwa, Lubon, and Nocht ally early on to attack Ayvarta, with the promise of helping take down the Svecthan Union and Kitan in the future, forming a counterpart to the Axis powers. The Confederacy of Helvetia seems to based on a much more powerful Switzerland with some British influence (Elves seem to be universally British in this universe, and Helvetians possess ULTRA) but not much is known about them. The Pact they mention could be a counterpart to the Warsaw Pact. The '40s: Though there's not much recognizable "Forties culture" (no Swing dancing scene so far), the tech fits. General Failure: Every faction has a couple commanders who are less than optimal. Genre-Busting: "Military Fiction" doesn't quite cut it on its own, when it also has the trappings of dieselpunk, epic fantasy, alternate history, period romance, and even anime. Gratuitous Foreign Language: There's a bit of Swahili, Hindi, German, Spanish, Russian and Italian around though the story's primary language is English (and the author's is Spanish). Great Off Screen War: There are a lot of these mentioned, including the Ayvartan Civil War, the Nocht Unification War, and some unnamed past conflict where Lubon lost all of its colonies. As of Chapter 49, also add the ancient war between the "windborne" and the people of the "holy land." Grey and Gray Morality: Ayvarta has a sordid past, and the destruction suffered during the Revolution and Civil War still haunts the continent. Many characters in Ayvarta wonder whether the price that was paid was worth it. Meanwhile, Nocht's expansion into the continent is coldly utilitarian, despite their claims to a righteous cause. The Hero: Madiha Nakar is a depressed lesbian suffering from PTSD who has to face down a whole army with inferior, disorganized forces and no cooperation from bickering regional authorities. She's also the Ace. Heroic RRoD: Madiha's abilities run the risk of damaging her mind and body; it's implied this is abnormal and an effect of the revolutionaries exploiting her abilities when she was young. He's Back: Madiha spent much of the Battle of Bada Aso in a very severe depression, due to the weight of thousands of young soldiers she sends to their deaths, and her final gambit being to blow up the city she had many attachments to. After a Battle in the Center of the Mind and a lot of help from Parinta, she mostly recovered by the end of the battle. Home Field Advantage: Madiha takes advantage of Bada Aso's strategic location to force Nocht to enter a protracted, draining battle, and planning to eventually abandon the city, but detonate the natural gas in caverns under the city. Hold the Line: Shown on several occasions. Ayvartans might be inept on the offensive, but give them a trench or a bunch of sandbags and they will make you bleed. Improbable Aiming Skills: One of the more common ways Madiha's abilities manifest. It's to such a point that when Madiha insists on going out to inspect something during a battle, Parinta makes sure she has a machine gun to take down planes strafing the road. She takes one down and damages another critically. Lady and Knight: Byanca Geta dreamt of having this kind of relationship with a noble lady as a child. It ends poorly, and she becomes a blackshirt legionnaire instead. Lightning Bruiser: The Raktapata tank is as fast and maneuverable as any light tank but with firepower to take out almost anything it finds. It's also a very rare prototype. Living Emotional Crutch: Parinta to Madiha. There's a supernatural component to it as well, but their emotional bond seems to be more important. Low Fantasy: The Solstice War takes place in its own version of the 40s, but the world is pretty different from our own. Magic and monsters are said to have existed, but don't seem to anymore (with a few notable exceptions); however some weird "animals" are mentioned, including Drakes. While the conflict is carried out with guns and tanks and planes and manpower, there is an undercurrent of the supernatural. Made of Explodium: Almost all tanks hit by Ayvartan cannons burst into flames and explode. This is explained in that Ayvartans favor Armor-Piercing High Explosive (APHE) over other shell types. Militaries Are Useless: Averted. Small heroic forces are at a brutal disadvantage against big formations and can only hope to stall for time until they can retreat with huge losses. Mood Whiplash: After Mansa's veritable filibuster of a speech concerning some incredibly disturbing revelations in Chapter 48, Von Drachen pauses the conversation to demand that he be addressed correctly (it is General *Von* Drachen, NOT General Drachen alone). Multi-Track Drifting: Tanks tend to be written a lot more intensely than their real life speed and maneuverability would suggest is possible. Pyrrhic Victory: War is never clean here, even for the victors. Nocht technically won the Battle of Bada Aso, and even suffered fewer casualties... but they lost almost their entire air strength, a sizable amount of their tanks, and suffered a very demoralizing blow to their planned blitzkrieg. But likewise, Ayvarta lost the city and all control over the southern provinces. Red Baron: Madiha is The Right Hand of Death. Rousing Speech: A few in some dire situations. The Solstice War has quite a few Gundam references, but what it has the most references to, of all things, are internet memes. Many of them are tumblr or 4chan memes. In Chapter 34, Reiniger bursts through a wall with the Dicker Max, shouting "OH YEAH." In Chapter 43, Madiha, in a stresssful and awkward moment within a large crowd of admirers, quotes 4chan meme Ivan Chesnokov by telling the crowd to "practice with many cartridges." In Chapter 47, Gulab mistakenly refers to Kali as a "dorge" instead of a drake or dragon. Kali then proceeds to strike a distressed-looking pose, like that of the popular Doge. Shown Their Work: There's a lot of war nerdery to behold (see if you can identify all the tanks), though the author has said that the story is not meant to be 100% realistic to the period. The Stoic: Ayvartan KVW agents, officers and soldiers are offered a form of conditioning that renders them this way. It appears to be a consensual process that dulls their emotions, protecting them from fear and anxiety in battle, but not every KVW member qualifies for it, and all those who do seem to get somewhat different effects. Super Prototype: The Raktapata tank is a derivative of another prototype tank, tweaked by Chief Ravan to mount way bigger guns than intended. It so fast and destructive that its pilot, Naya, takes out way more experienced enemies on her very first outing with it. Tomboy and Girly Girl: Madiha wears the pants uniform, Parinita wears the skirt uniform. Madiha is more emotionally reserved and driven to (sometimes reckless) action, while Parinita is gregarious and charming and tends to take a supporting role behind Madiha. Troubling Unchildlike Behavior: At 8 or 9 years old Madiha joined the Zaidi, marxist revolutionaries, as a courier. It is implied she did much more than that, however, as she's shown in a flashback saving Daksha's life by killing a man with a gun. Due to her abilities, it is heavily implied that she carried the revolutionaries to victory. Tsundere: Salvatrice has a few cliche Harsh Tsundere moments toward Byanca. Judging by the story's inspirations this is probably deliberate.